Jim Weddle, a partner and CEO at Edward Jones, will be the 2016 Commencement speaker. 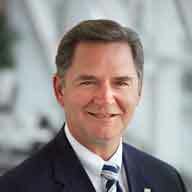 ST. LOUIS – Jim Weddle, a managing partner and CEO of Edward Jones, a global Fortune 500 firm based in St. Louis with more than 11,500 branch office locations in the United States and Canada, will serve as this year’s Webster University Commencement Speaker. He will address nearly 1,000 graduates and their guests during Webster’s 97th annual Commencement Ceremony at St. Louis’ historic Muny at Forest Park outdoor amphitheater on May 7, 2016. Weddle, a former member of Webster University’s Board of Trustees and the parent of two Webster alumni, will receive an Honorary Doctorate of Business Administration for his lifetime achievements and contributions to the community and leadership in the financial services industry. Weddle, who started working at Edward Jones in 1976 as a part-time intern, contributed to the firm’s tremendous growth and rose to the firm’s highest leadership role – that of managing partner - in 2006. Today, Edward Jones has more than 7 million customers, more than 14,500 financial advisors and is one of the largest financial firms in the country. A native of Illinois, Weddle attended colleges in Indiana and Missouri, earning his bachelor’s and MBA. He also graduated from the University of Pennsylvania Wharton School's Securities Industry Institute in 1988. He has spent his entire career at Edward Jones, and was hired in 1976 as a part-time intern in the firm’s Research department while finishing his MBA. After graduating, he was named a financial advisor in Connersville, Indiana where he oversaw the opening of Edward Jones’ 200th branch. In 1984, he moved to St. Louis where he assumed a series of responsibilities in Training, Marketing, and Branch Administration. In 1988 he became a member of the Edward Jones’ Management Committee, and in 2006 he became the fifth partner in the firm’s history. Weddle is a current executive committee member for the United Way of Greater St. Louis; a member of the Barnes Jewish Hospital Board and BJC Health Care Board; and a member of the Financial Industry Regulating Authority (FINRA) Board of Directors. He is a past board member of the YMCA of Greater St. Louis; a past member of the Webster University Board of Trustees and Executive Committee; a past member of the Board of Commissioners of the St. Louis Science Center; a past board president of FOCUS St. Louis; and a past board member of the Securities Industry & Financial Markets Association (SIFMA). He also has served on advisory boards for several other St. Louis institutions of higher education. Besides Weddle, current Board of Trustees member Carmen Jacob will deliver the official “Words of Inspiration” during the Commencement. Jacob is president of NextGen Information Services, Inc. The Commencement ceremony will be held at 9:30 a.m. at The Muny in St. Louis’ Forest Park. The event is open to all graduates and their families and friends. For more information on the Commencement, visit www.webster.edu/commencement.